I play the piano and love cherry tomatoes. Tiffy at work but my husband and my friends call me Gary after a cat we knew. He says our temperaments are similar. Spiders in my bed, obviously… And waiting for ‘someday’ (which is not a day of the week) to tell my stories. I hope I can continue to connect with my awesome readers in a really fun way and not let anxiety get in the way. My greatest fear was planning a wedding, but I recently conquered that and proved to myself that anxiety (as Seth Godin says) is worrying about an imagined future that hasn’t happened yet, a fear about fear, a fear that really means nothing. Being trapped in psychological time robs you of being present in the now, which is so important when having ideas, writing and connecting with readers in a pure way. Happy, elastic, light, adventurous, lizard obsessed, martial arty and fitness friendly. Maxine Edwards in my new novel. She has a money tree! Although it gets her into heaps of trouble…it’d be fun for a day, don’t you reckon? 1969 to watch the first man walk on the moon. This would have blown my mind to see as a kid! I think everyone who lived in this moment would have believed the impossible to be possible. Believing in the impossible is at the heart of writing kids books. Chill and stop stressing out, instead loosen up and have fun! When you are stressed you are less creative. I’ve always had my best ideas when I’m relaxed, happy and having fun. The energy you put out in the world is very important. So act like a kid more often, play, be silly and for goodness sakes, stop worrying about what other people think. John Marsden. He was my English teacher at school. He was the first real-life author I ever met and he was writing the Tomorrow series whilst teaching at my school so we learnt a lot about the writing and publishing process. He was inspiring and super cool. I was a really shy kid. It felt more natural to make friends with the page and express myself through writing than to tell other people how I felt. My sister would be given Barbie dolls to play with but I was always given a book. A voracious reader, I was enchanted by Alice in Wonderland and the worlds of Dr Seuss and Roald Dahl. John Marsden was also influential and I still remember being introduced to Shakespeare and his vocab. The world of words unleashed. I felt alive. Effervescent. When you say the word, it feels like there are bubbles on your tongue. 100 Years of Solitude by Gabriel Garcia Marquez or Wonder by RJ Palacio. 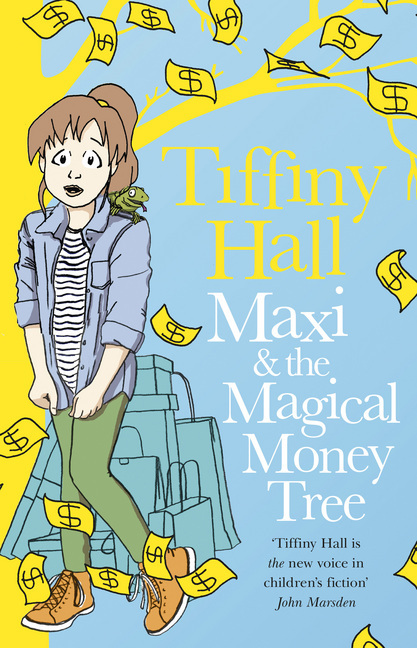 Tiffiny Hall is an Australian author for children with a background in journalism, fitness and martial arts. White Ninja, the first book in the Roxy Ran series, was included in the '50 Books You Can't Put Down' list for 2012. Tiffiny's latest book is Maxi & the Magical Money Tree, published by HarperCollins. Visit Tiffiny's website and Facebook page for more information about her books and events.